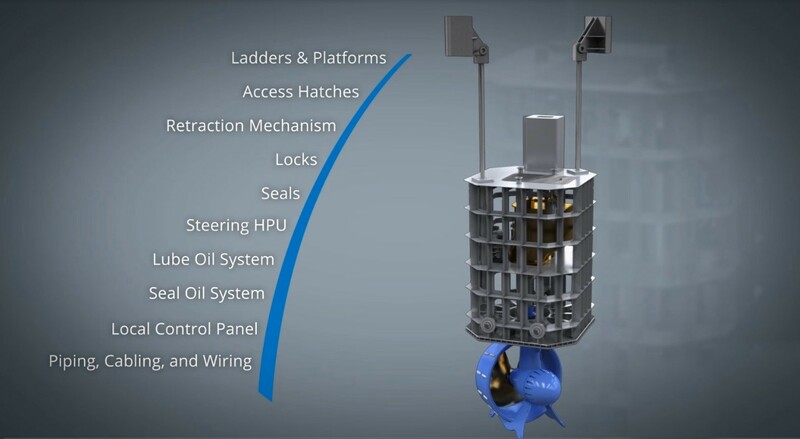 By: Joe Bekker, President Thrustmaster of Texas, Inc.
As offshore oil and gas exploration continues to move into deeper waters, drilling deeper wells, the environmental demands that drillships must meet foster a need for more sophisticated and expensive equipment. Today’s ultra-deep water drillships demand day rates upwards of US$ 500,000. It certainly gives meaning to the old adage that time is money. The modern UDW drillship is self propelled for transit and dynamically positioned for drilling operations equipped with six azimuth thrusters, three in the forward half and three in the aft half of the vessel. The thrusters are rated at 4.5 to 5.5MW each. The thrusters are mounted to the bottom of the hull and they are underwater (dis)mountable. The thrusters use propellers in nozzles and the bottom of the nozzle extends 5 to 6 meters below the bottom of the hull. 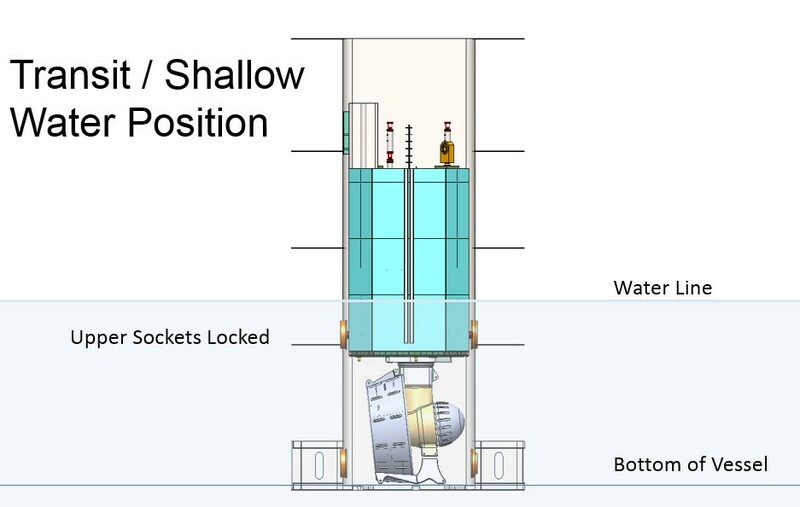 Assuming a transit draft of the vessel of 11 meters, the forward thrusters extend as much as 16 to 17 meters below the surface of the water. The major areas where ultra-deep water drillships are operating are located in the deep waters of the Gulf of Mexico, Brazil and West Africa. There are no ports in any of these locations deep enough to allow a vessels with a draft of 16 to 17 meters. 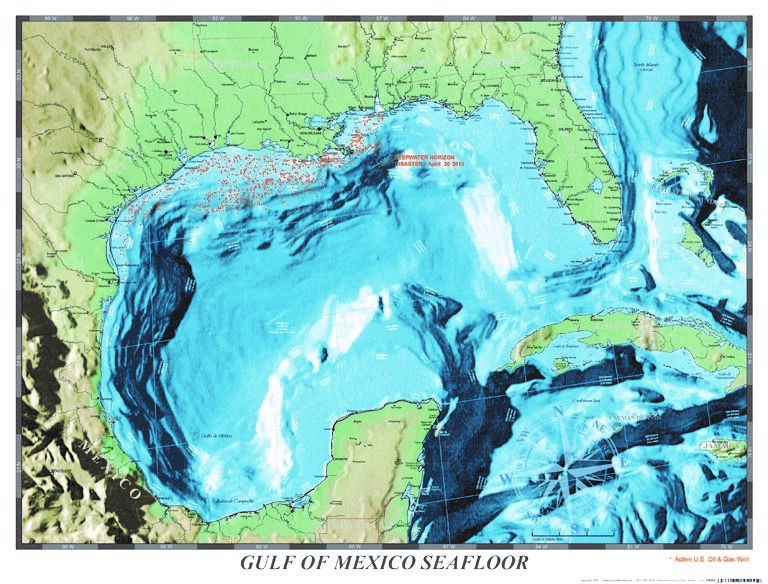 In fact, an UDW drillship with thrusters extending 16 to 17 m below the waterline would have to stay more than 160 km out of the coast in the Gulf of Mexico, as the shallow rim of the shelf is less than 20 m deep. To move in closer to the coast, the forward thrusters would have to be dismounted; a four to five day job involving divers, a crane barge or crane vessel and a number of support vessels. Including the cost of lost production at a $500,000 day rate, the cost is roughly $4 million. Of course, the thrusters will have to be reinstalled when the vessel goes back to work at a cost of another $4 million. This is assuming that the weather is good enough to allow diving operations offshore. If the weather is rough, the vessel will have to wait for a favorable weather window, with a further additional cost of $500,000 a day. Between contracts, a drillship may need to transit thousands of miles to go to the new drilling location. Transit times may be as long as several weeks. Most drillships use only two or three stern thrusters for propulsion during transit. The forward thrusters are either windmilling, blocked from rotation or running at low speed to limit the drag resistance. That drag resistance from the forward thrusters reduces the vessel speed. This results in increased transit time which, at $500,000 per day becomes a real issue. To address these issues, some UDW drillship operators use retractable forward thrusters. Retracting the forward thrusters during transit eliminates the drag resistance and allows for transiting at a higher speed. 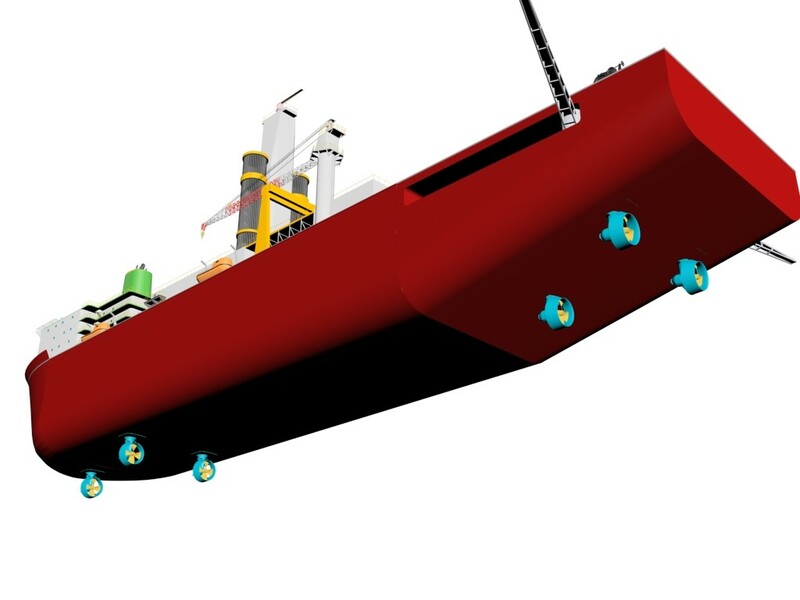 It also allows them to enter ports, transit in shallow waters and put the vessel in dry dock without having to dismount the thrusters.Thrustmaster offers UDW drillship thruster packages, whereby the forward thrusters are hydraulically retractable. Each retractable thruster uses a canister inside a trunk whereby the canister can travel up and down in the trunk using either a rack and pinion system or hydraulic cylinders. The canister contains the electric motor, the steering and lubrication equipment and the thruster is mounted to the bottom of the canister. The trunk of the canister does not protrude through the main deck and there is no need for a deck hatch or soft patch. There is zero impact on usable deck space. The canister is essentially a small machinery space. 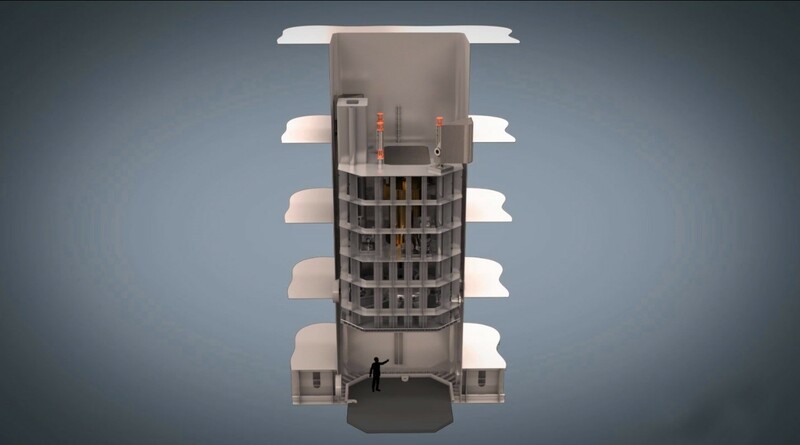 Normally it is unattended, but operation and maintenance personnel can enter the canister via a hatch in the top. The canister is provided with ladders and platforms, ventilation, lighting, and bilge water control. The thruster suspended underneath the canister is underwater (dis)mountable. 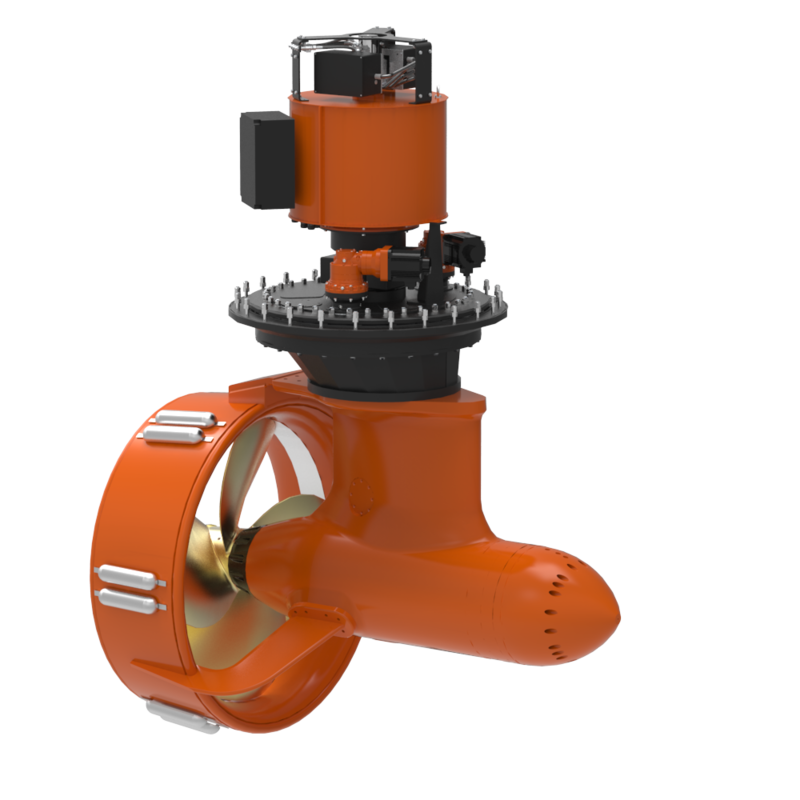 This feature allows removal/replacement of the thruster for major maintenance or overhaul without the need for dry-docking. There are hawse pipes installed inside the canister for the lifting anchors and lifting wires and there are seats for strand jacks on top of the canister to facilitate this. With the thruster in its retracted position, a neutrally buoyant bottom closing cover can be installed by divers and the water in the trunk can be pumped out to create a habitat accessible via a water tight hatch in the trunk. This allows visual inspection of the thruster and minor maintenance. It also allows replacement of the canister bottom seal and replacement of the sockets for the canister locking pins, if that would ever be needed. Thrustmaster’s retractable thruster system resolves issues of drag, docking limitations, and maintainability while achieving strong utilization throughout the drillship’s operation.